How will Your Site Look on a Mobile Phone? Starting in April of 2015, having a mobile-friendly website is no longer a nice option to have but is now absolutely essential! Not sure if your website is “Mobile Friendly”? Well you can use Google’s own “Mobile-Friendly Test”. All you have to do is enter the URL (website address) of your website. and press the “Analyze” button and the tool will do the rest. Below is an image of what the tool looks like. 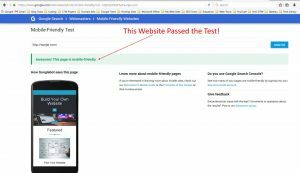 The total testing time takes about three minutes and when it’s complete, it will tell you if your site is mobile friendly. Below are screen prints of the tool in action. That’s great and there really isn’t anything else for you to do, Google has determined that your site is OK. If your site did not pass the test, then you have a little work to do. For more information on fixing your website if it does not pass, sign up to receive my eBook to learn how to make your website mobile friendly.